– Coronation Service of the Pontiff. T = TRINITY OF GOD USURPED! The Pope claims the place and names that belong to God alone (Vatican II, Lumen Gentium, III para. 18). God, the Father: He claims he is “The Holy Father”. This is the unique name of God the Father.John 17:11 “And now I am no more in the world, but these are in the world, and I come to thee. Holy Father, keep through thine own name those whom thou hast given me, that they may be one, as we are.” — ‘Thine own name!’ It is God’s name alone – it cannot belong to anyone else. The Pope even takes the very name of God. The New York Catechism calls the Pope, “the arbiter of the world, the supreme judge of heaven and earth, the judge of all, being judged by no one, God Himself on earth.” THE TRINITY OF GOD IS USURPED IN ROMAN CATHOLICISM! I = INTER-MEDIATION OF CHRIST USURPED! The Bible states, “There is one mediator between God and men, the man Christ Jesus; Who gave himself a ransom for all, to be testified in due time” (1 Timothy 2:5,6). Rome claims that in her masses she can repeat the sacrifice of the cross and change the wafer and wine into the very body and very blood of Christ. She claims that she perpetuates the sacrifice of the cross (Eucharisticum Mysterium, Intro. C, 1). Again, “In the sacrifice of the Mass our Lord is immolated” [killed as a victim] (Ibid, C, 2).Christ cried on the cross, “It is finished” John 19:30. Rome has elevated Mary to the place of mediation. John Paul II states that “in Mary is effected the reconciliation of God with humanity” (On Reconciliation and Penance. St. Paul Editions, p. 139).No Christian can accept “The Cult of the Blessed Virgin” (Vatican II, Lumen Gentium, VIII para. 66). It is idolatrous and an insult to our Lord Jesus Christ. THE INTER-MEDIATION OF CHRIST IS USURPED BY ROMAN CATHOLICISM! A = AUTHORITY OF THE BIBLE USURPED! The Church of Rome cannot establish her false claims that she alone is the preserver of God’s Word and the maintainer of the Truths of the same. Rome is far from being a believer in the Bible as the sole rule of faith and practice. Her rejection of the Bible as the sole rule of faith and practice has been brought about by the many additions she has made to Holy Scripture. The command and warning of God is crystal clear that the Bible must not be added to. Now the Church of Rome has been found out to be a liar and has had added to it the plagues of the Apocalypse – as God stated in Proverbs 30:6 and Revelation 22:18 – by adding to God’s Word. Rome adds to God’s Word by adding more books to the Canonical Scriptures, known as the Apocryphal Books. These books were never received by the Jewish Church (Romans 3:2); they were never quoted by Christ; they were rejected by the Christian Fathers; and they are self-evidently not inspired. The writer apologises for defects (2 Maccabees 15:39) and one seemingly commands suicide. They are no part of Holy Scripture; yet, they were added into the Canon by the Church of Rome to make up Rome’s Bible. Rome also adds to the Bible apostolic and ecclesiastical traditions. Oral tradition evolved into written tradition and the unreliability of oral tradition is exposed in John 21:22,23. Rome also adds that the interpretation of Scripture must have the “unanimous consent of the fathers”. Alas the fathers were far from being unanimous. They contradicted themselves and rarely consented. In fact, strange to relate Gregory the Great Bishop of Rome stated that the Bishop who claimed to be the Universal Bishop is the forerunner of the Antichrist (Gregory Reqisto. Epist. 1.b. v11. Ind. Is epis 33 ed Benet Domisitos). Christ warned against tradition and stated, “Why do ye also transgress the commandment of God by your tradition? Thus have ye made the commandment of God of none effect by your tradition. But in vain they do worship me, teaching for doctrines the commandments of men”(Matthew 15:3,6,9). Rome stands out as a self-exposed liar and as the target of the judgments of Almighty God by her deliberate adding to the Holy Scriptures of Truth. At the end of the 19th century Rome added on to the Scripture the infallibility of the Pope having for years said that the doctrine of the infallibility of the Pope was a “Protestant falsehood” (see Papal Catechism). 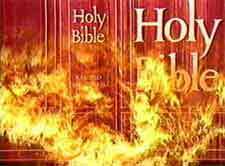 THE AUTHORITY OF THE BIBLE IS USURPED BY ROMAN CATHOLICISM! R = REMISSION OF SINS USURPED! John Paul II states “It would be foolish and presumptuous … to claim to receive forgiveness while doing without the sacrament” of penance (On Reconciliation and Penance p.115). He further insists that the individual confession to a priest to receive absolution from him “constitutes the only ordinary way in which the faithful who are conscious of serious sin are reconciled to God” (Ibid, p.132). The Lord Jesus never put any earthly priest or Pope between Himself and the sinner. THE REMISSION OF SINS IS USURPED BY ROMAN CATHOLICISM! A = ASSURANCE OF SALVATION USURPED! Rome has put her curse on the Bible way of salvation. “If any man says that it is by the righteousness of Christ itself that men are formally justified – let him be accursed” (Council of Trent, Session 6, Canon 10). “Sins must be expiated. This must be done in this earth through the sorrows, miseries, and trials of this life and above all through death. Otherwise the expiation must be made in the next life through fire and torments of purifying punishments” (Indulgentiarum Doctrina, I para. 2). Purgatory is not found in the Bible. There is no future wrath for justified sinners. You can be saved now and have full assurance of faith in the certainty that you know you have eternal life. You require no priest but Christ alone (Hebrews 4:15). You require no sacrifice but Christ alone (1 John 1:7). You require no mediator but Christ alone (1 Timothy 2:5). The Pope’s “bad news” points you to Purgatory – a non-existent place! The Lord Jesus Christ’s good news (or gospel) points you to Paradise by simple faith in Himself. Good news indeed! Be warned! Rome’s Catholicism is not Christian. THE ASSURANCE OF SALVATION IS USURPED BY ROMAN CATHOLICISM!